What is love? How would you define it? I’m going to be completely honest right now. I am routinely forgetful about brushing my teeth twice a day. I know, gross, right? Luckily, I’m not prone to horrific breath due to the fact I keep well hydrated, I’ve sworn off cigarettes, and I don’t eat meat. Also, I am partial to mint, green, and white tea. Don’t get me wrong, it’s not like I go a week without brushing. But, I’ve grown out of my obsessive need to brush three times a day. I’m currently in the process of getting rid of any dental care products with fluoride and sodium lauryl sulfate. This switch is fun, although a bit challenging. Finding “alternative” products that taste good and work has been interesting. Right now, I’m loving Jason Sea Fresh toothpaste. Not super minty, but it cleans my teeth very well. And, a plus is that it has blue green algae and calcium carbonate to help protect the natural enamel. I’ve only had one cavity in my life, and it was a baby tooth. My adult teeth are cavity free (I’m the only person in my family who has cavity free teeth! ), so I’ll do anything to keep my teeth that way. he toothpaste also has parsley, which is a common bad breath neutralizer. I keep some of Lush Cosmetics’ Toothy Tabs in my school & work bag, in case I end up eating something garlic or onion laden. My favorite ones are Chou Chou and Dirty. These are handy to have when you are on the go and especially if you are traveling. They are dry, so they can come on a plane with you. Who wants to be left stranded without a way to brush your teeth? The toothbrush I currently use is by Preserve. They are a great brand that has a wonderful recycling program. I hate throwing away toothbrushes, yet can’t quite get on board with an electronic brush. As far as mouthwash goes, I used Crest for awhile. Again, in an attempt to clean up my oral hygiene, I’ve switched over to something considered more “natural”: The Natural Dentist Healthy Balance Rinse. I’m obsessed with this. It’s Peppermint Sage and tastes so fresh! Peppermint is just a great breath freshener and sage is a very mild antiseptic/astringent agent. (Here’s some basic research on sage.) This rinse also has Xylitol, a sugar alcohol sweetener that has been studied to help prevent tooth decay. Instead of being a “regular” sugar that bacteria likes to feed on, xylitol is non-fermentable, therefore essentially starving the bacteria and allowing for less decay and, perhaps, even a slight remineralization of the enamel. Sorry, bio-chem lesson is done! I promise! Another quick and easy mouth rinse I use is a DIY one. I’ll get an ounce of water and put in a few drops of some essential oils. 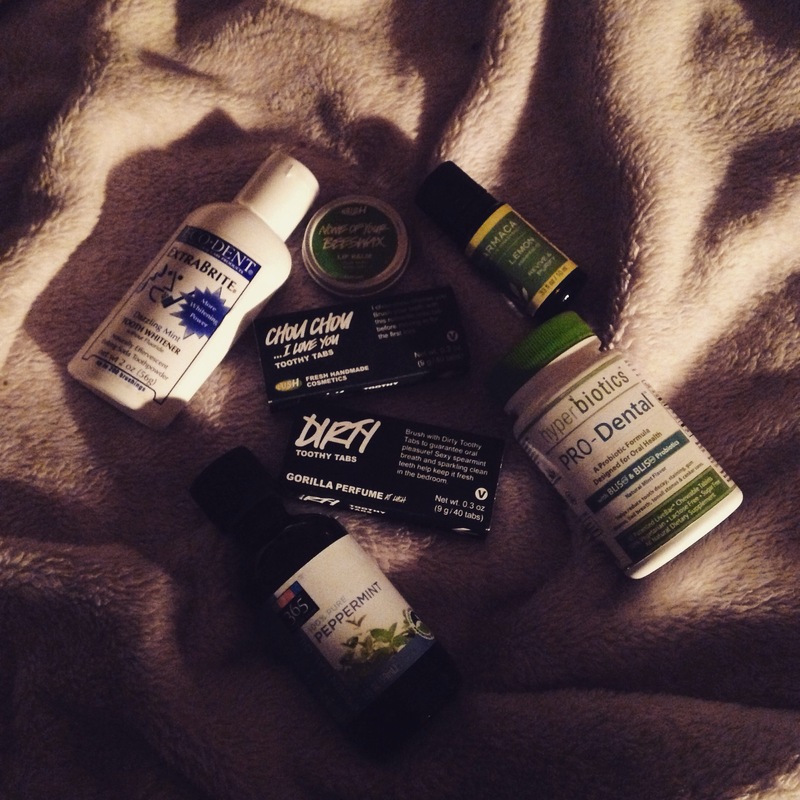 The best to use are peppermint, lemon, and tea tree. The peppermint for freshness, the lemon for sweetness and antibacterial properties, and tea tree for antimicrobial/antibacterial properties. In a pinch, it gets to job done! For the last week, I’ve been fighting off a cold. This inspired me to update my oral health routine, as our mouths can be pretty gross. And, as I mentioned, I’m not one to brush twice a day. Again, gross, I’m sorry! I was introduced to a supplement called hyperbiotics PRO-Dental. * This is a mint flavored chewable supplement that puts healthy, good bacteria at the source of bad breath, canker sores, gingivitis, and possible ear/nose/throat infections. Now, I know a cold is a virus, so probiotics can’t decrease the time of a cold. But, allowing my mouth to fight off bad bacteria and replenish it with good bacteria, I’m protecting my mouth in some manner. The recommended dosage for maintenance is to chew one pill once or twice a day after brushing/rinsing. The idea is to replenish your mouth with the good bacteria will there is a minute amount of bad bacteria in it. They have a intense repair suggestion, which I’m currently doing. They suggest you chew 2-3 tablets once or twice a day. I usually remember just to chew three tablets once a day, which is much better than nothing! It’s only been a week, so it’s too soon to tell how effective this new routine really is. One thing I have noticed is that my breath has been a lot fresher, which is unusual for me when I have a cold. I definitely suggest this to anyone who does have oral health concerns or is prone to ear/sinus/throat infections. For purchase, their site (available above) directs you to Amazon. In another post, I’m going to talk about lip care. I’d like to share it here, but there is so much to say. For your enjoyment and my sanity, it’s best if I call it a night and write the post later this week. Happy trails everyone! Hope you all are having a wonderful February. Remember to smile and laugh and enjoy life! *This is a sponsored post powered by BrandBacker. I received the supplements free of charge to try. Everything else was paid for with my own money. Neither BrandBacker nor hyperbiotics told me what to say or how to write this post. My opinions are my own, and I will never discuss a product if I don’t believe it has merit. Two (three, really) posts in one day!? What a treat for me and you! This post will be short and sweet. Here’s a little something you can do this weekend to treat yourself: eat some tasty fruit and dark chocolate. Make your own trail mix. Drink some iced green tea. Get healthy fats, carbohydrates, and antioxidants running through your body. Do some deep breathing exercises and make a list of ten things you are grateful for. Fall asleep smiling. Enjoy yourself.